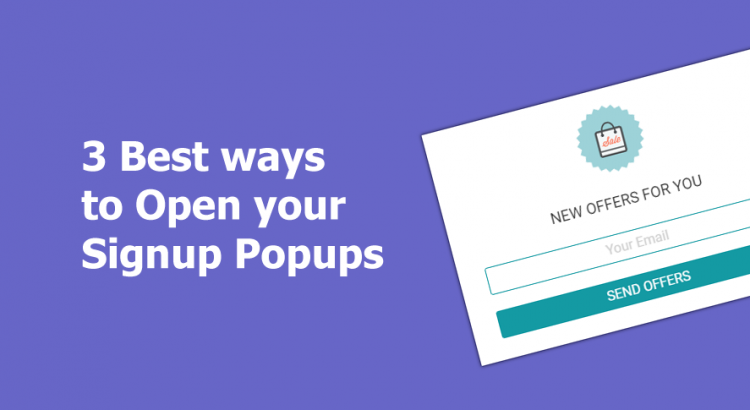 Pop-ups are great for conversions, and helps you grow your email list faster than any other way. But, Pop-ups are un-healthy for your website too, if you end up showing pop-ups blocking your content, your visitors are likely to exit and never return to your site. Its a bad thing, but there are some ways to do it the right way. Timing of Pop-up is everything, Imagine if you open Pop-up as soon as they enter your website, more visitors feel that you are blocking them just for their email and exit. So Immediate Pop-ups are bad for every site? Not really, If you are offering discount on your existing products, or you have a new blog article to check, or you have some trending news then informing your visitors about the new thing should be as soon as possible. But for showing regular signup forms its best to avoid immediate opening Pop-ups. Give your visitors some time to check around your website and then bring your Pop-up to view, say 10 or 15 seconds. So Delayed Pop-ups are the way? visitors read the first few lines of your webpage or above-fold content so make sure you keep some engaging content thats easy to understand and give the Pop-up some time so it opens approximately when users finish reading your above-fold content. Since you don’t know when they actually start reading or finishing the above-fold content, these delayed Pop-ups aren’t going to be very accurate, its just approximated timing. Whats the accurate way to open Pop-ups then? We can’t control the visitor behaviour so there is not going to be an accurate way to guess how much time it is before you open Pop-up signup forms. But, you can make the visitors to interact on your site and open it on their Interaction. Add some interesting content and put a Link/Button on your site, open your signup form when visitors click that link/Button. Since the click is initiated by the user, chances are very high that they signup on your form. If you are writing a blog post in which you cant put link to signup, placing link/button in middle of article discussing some thing else will be a distraction. Imagine you are explaining how a website works in your blog post, placing “Sign up for more” after the very first paragraph would look bad. Whats the best way for blog articles then? There is a way, when visitors are reading your engaging content and reach to the by scrolling down, you open the form then. Displaying the form after the completed reading the article(scrolling till bottom of the page) gives best results. People who connect to your content will only read till end of your articles, so those connected visitors are very likely to give their email ID to you because they liked your article and read till end. This method will also result a very high conversion rate like #2. So thats all to take care? There are 3 more tips to not frustrate your visitors, though these depends on content length or time required for article and type of content. #1 Don’t over do Pop-ups – make sure you don’t show the pop-up again and again for the same user. #2 Keep engaging content on above-fold part – You could prepare the whole article with good content but best of the best on above-fold. #3 Encourage them to take actions like clicking buttons/links. And don’t forget to show the Pop-up when they try to leave your website – This is only if they have not seen your form yet, Imagine you added Pop-up to Open after 10 seconds, but if they try to exit with in 5 seconds, you should attempt to show the Pop-up. So when the Pop-up is not displayed yet and they are trying to exit then show the form so you have one more last chance to convince them. Apply these ideas to your site and see the growth. Try Optingun to create #1 immediate opening Pop-ups or #2 Opening Pop-up on Click of a Link/Button or even #3 Opening when visitors scroll to bottom of the site, it just takes lessthan 5 minutes to do these with Optingun, try today for FREE if you don’t have Optingun account yet.